Our lovely Little Gem is located in the picture perfect village of Denham – and although we may be modest in size, we’re certainly big on country charm, delicious food and friendly faces. Monday lunch time, busy but not packed. Fairly cool, haughty reception on arrival. Prompt service for drinks and food order, all great so far. Food arrived, gnocchi with mushroom really wasn't to my taste. Gnocchi a bit over cooked, mushrooms tough and tasted bark like and the pesto lacked flavour. Just a poor bland dish but presented very well. Just as we were leaving our children started to wander about a little accompanied by an adult and we were chastised for disturbing their other patrons. Do not say children welcome when they are really just tolerated in a seen and not heard kind of way (they were quiet most of the time they were there). Patron's mostly at the senior end so guess more suited to that clientele. It has a really good large back garden that would be fantastic on a sunny day, great area for kids to run about. Nice place just could do with a slight tweak of attitude and an improvement in food, not rushing back. We had a delicious meal at the Swan yesterday, roast lamb, beef and pork all excellent. Impeccable, as usual, the lamb was superb and the desert (we had the bakewell and goose bury) were great. It’s one of the nicest restaurants in the area , the food is delicious the staff are lovely and little  pub dog is cute. Unfortunately our experience for Mother’s Day at The Swan Inn was not very pleasant. When we arrived, we were not greeted and it was not clear whether to wait or go to the bar. When I went to the bar and asked about the table the barman directed us to a booked table for 4 which had been squashed into the corner and would definitely not have fitted 4 adults. Although it had been set, the table next to it had spread out and were using serviettes and cutlery at their will from the table to clear up the mess that the children who had over spilled their table had made. No comments were made from the barman who left us to it so we obviously left. Such a shame for a planned lunch for Mother’s Day. Will not return at a weekend and would recommend others do not book a dining experience either. I ate here a few months ago and both the food and service were amazing. Unfortunately this time both were not of a good enough standard. The bread in the sausage sandwich wasn’t fresh enough and the coffee was lukewarm. Service was inattentive and response to requests was slow. Absolutely loved the new Spring Menu! The lamb dish was fantastic, the lamb was cooked to perfection! Whenever I have come to the Swan Inn, the food and drink has always been amazing! The service spectacular and the atmosphere great! Keep it up, a little gem like this is hard to find these days!!! Massive thank-you to Mark and the team for yet another lovely visit! My husband and I dined at the Swan for the first time in a few years, as we moved from the area some time ago, with two friends. We were all very impressed with everything, and felt that we had one of the best dining experiences in recent times. Thank you. Great new menu sampled last night, so good we're going again later. The staff and the welcome as always was excellent. Our first time visiting. We had a great family lunch and the beer battered fish was excellent. The boys liked their Sunday roast. There was a mix up with the wine but they sorted it out very promptly. We took our dog too. Would recommend the Swan Inn. we had a small issue with some food and the staff resolved it really quickly and professionally and left us feeling like the restaurant cared about quality and service. Gets busy book early to avoid disappointment. Excellent meal & service, well looked after and staff were professional. Our experience of the Swan is always good. Very good lunch, no issues whatsoever. 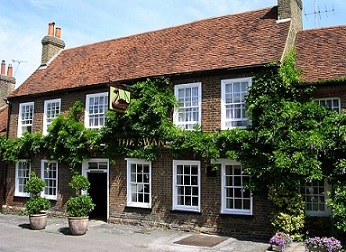 We have rarely been disappointed with The Swan, their menu is different and changes regularly. What a lovely pub! Now just looking forward to enjoying a meal in the lovely garden in the summer!